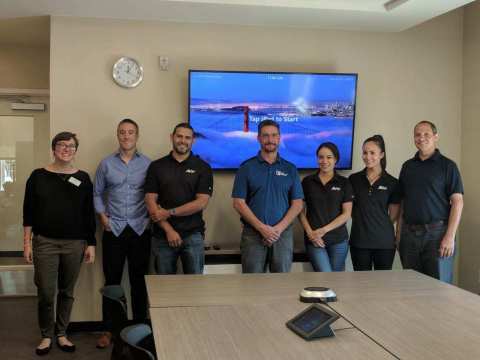 FREMONT, Calif.--(BUSINESS WIRE)--AVer Information Inc., award-winning innovator of video conferencing technology, announces it has partnered with Zoom Video Communications, Inc. and VideoConferenceGear.com (VCG) to turn two rooms into Zoom Rooms. AVer’s contribution will benefit Brent’s Place, a long-term home away from home for families and children with cancer and other life-threatening illnesses while they receive treatment at local hospitals. With the new equipment and Zoom Rooms, the patients and their families will be able to video conference their loved ones and work associates, stay up-to-date on school assignments, access the internet, and participate in meetings that would otherwise not have been possible. “The Zoom Rooms at Brent’s Place will help families connect with their loved ones during this stressful time in their lives,” said Ryan Pinke, CEO and founder of VideoConferenceGear.com. Brent's Place in Aurora, Colorado is the only facility of its kind nationwide that specializes in Safe-Clean housing uniquely designed and maintained to minimize the risk of infection for severely immune compromised patients. In 2017, Brent's Place helped 179 families in need of Brent’s Place Safe-Clean environmental standards. “Zoom is happy to help families at Brent's Place to communicate with loved ones and work remotely while they are away from home. We hope that these resources allow for more personal connections within the Brent's Place community and for more efficient collaboration in their everyday operations,” said Steve Snyder, Sales Leader for Zoom Video Communications. Brent's Place (www.brentsplace.org) strives to provide a unique home away from home, that vigilantly protects the fragile health of patients while also strengthening the integrity of the family unit, enriching day-to-day life and fostering an unwavering community of support. The Brent Eley Foundation is a 501(c)3 organization. VideoConferenceGear.com (VCG) has been leading the charge of cost effective and easy to use Zoom Rooms and video conference rooms for clients all over the world since 2010. VCG is a full service design, deliver, deploy, and manage Zoom Room integration partner with thousands of rooms running on every continent. All hardware delivered by VCG is tested for quality and reliability before it is recommended for a client’s environment. VCG is committed to bringing a high level of customer service to make sure your organization can communicate effectively and easily. Learn more about us at VideoConferenceGear.com. About Zoom Video Communications Inc.
AVer helps keep families connected while at Brent’s Place, a long-term home away from home for families and children with life threatening illnesses.